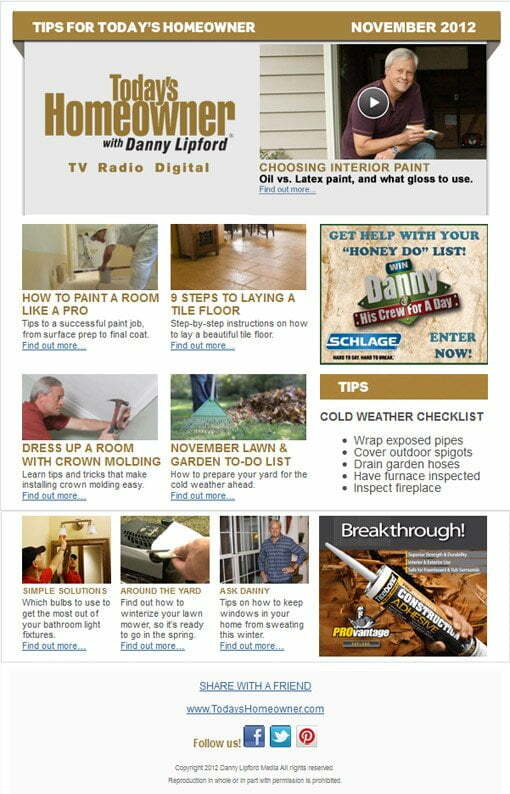 Tips for Today’s Homeowner Newsletter Has New Look! Our Tips for Today’s Homeowner newsletter has a fresh, new look and layout to provide you with even more useful information, so you can make your home the best looking house on the block! Each month our newsletter will arrive in your email inbox packed with great seasonal how-to articles, videos, and timely tips for your home—from remodeling and repair to gardening and green living. So what are you waiting for? Sign up for our Tips for Today’s Homeowner newsletter today at www.todayshomeowner.com/newsletter/ you’ll be glad you did! REALLY LIKE THE SHOW. DANNY AND HIS CREW SEEM LIKE THEY REALLY ENJOY WHAT THEY DO AND THEY PROVIDE VALUABLE INFORMATION. THANKS.